Scum Off Shower Cleaner is specifically designed to tackle the toughest jobs in your bathroom. Remove soap scum, hard-water stains, calcium, mineral deposits and grime from your shower doors and bathtubs without scrubbing! 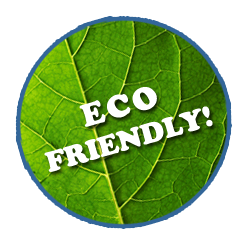 It's safe on any hard surface: plastic, acrylic, fiberglass, glass, tile & grout, porcelain, natural stones, metals and more. 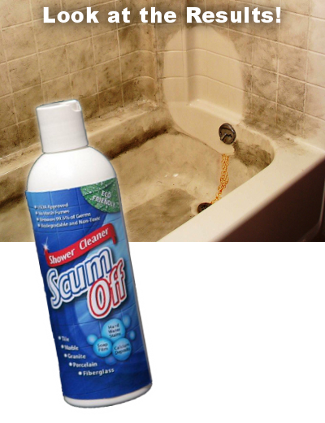 Scum Off is a concentrate so it has 100 times the cleaning power compared to bathroom cleaners bought in the stores. Plus, it has a 100% satisfaction guarantee! Use it on any hard surface: windows, mirrors, glass, stovetops, countertops appliances and more! Purchased this product at the San Diego County Fair (Del Mar) 3 days ago. Used this morning on terribly scum-stained clear glass shower door. I've NEVER been able to get this clean! Rubbed tiny bit all over glass w/ sponge. Returned about 1 hour later and rubbed gently w/ water using sponge; then wiped w/ clean dry rag. OMG I CAN'T BELIEVE WHAT I'M SEEING. Had to call my husband in to check it out. I live 50 miles from the fair; I'm returning JUST TO BUY MORE OF THIS PRODUCT! Got the 2-pack. Will get the half-gallon this time. WOW, I'm impressed.